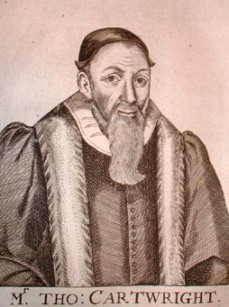 Thomas Cartwright’s (1535-1603) A Treatise of Christian Religion was a popular exposition of the core doctrines of the Christian religion which took the form of a catechism, divided into 57 short chapters, each focusing on a specific doctrine. Each chapter was headed by an illustrative text from Scripture. His chapter on the office of Christ is based on John 14:6. John 14.6 Jesus said unto him, I am the Way, and the Truth, and the Life. No man commeth unto the Father, batby me. Hitherto of the person of our Saviour Christ. What is his office? He is the only mediator between God and us, for our reconciliation unto him. What is his office of mediation? It is his calling to the works of reconciling men unto God. What consider you in this office? First, his calling, then his faithful discharge of it. What learn you from thence? There ariseth thereby great comfort unto us, in that he thrust not himself in, but came by the will of God and his appointment; thereby we are more assured of the good will of God to save us, seeing, he hath called his son unto it; and that he will accept of all that he shall do for us, as that which himself hath ordained. What learn you from his faithfulness? That he hath left nothing undone, of things that belong to our reconciliation: in which respect he is compared to Moses, faithful in all the house of God. What names are given him in regard of this office of mediation? The name of Christ; which was common to all those that represented any part of the office of a Mediatorship. What doth the name of Christ signify? What was the ointment wherewith he was anointed? How many mediators are there? By divers reasons. First, because there is but one God; and therefore but one Mediator, 1. Tim. 2. one God and one Mediator between God and man. Secondly, because he only is fit, as he only that partaketh both the natures, of God and man, which is necessary for him that should come between both. Thirdly, that is declared by the types of Moses, who alone was in the mountain: of Aaron, or the high Priest, who only might enter into the holy place of holy places. Fourthly, by the similitudes wherewith he is set forth in this text, I am the Way, I am the Doore. Fifthly, because he alone hath found sufficient salvation, for all those that come unto him. Heb. 7. and. 9. Joh. 10. Can no man be mediator between God and man? No verily: for Ely saith, that a man offending, a man may be accorded by the Judges; but if he offend against God, there is no man can make his peace. How many parts are there of this his mediation? Two: his priesthood, and his kingdom. It is the first part of his Mediation, whereby he opening the will of God, did also yield that obedience, whereof dependeth the whole merit of our salvation: First in teaching, then in doing the rest of the offices of the Priesthood. How is he our Prophet, Doctor, or Apostle? In that he hath opened the whole will of his father. By his owne testimony, Joh. 15. 15. I call you no more servants, because the servant knoweth not what his master doth. But I call you friends, because all which I have heard of my father, I have made knowne unto you. That it is a foule errour in them, that thinke that our Saviour Christ delivered not all things pertaining to the necessary instruction and government of the Church, but left them to the traditions and other mere inventions of men. That the Ministers of the word should not suppress in silence the things that are necessarily to be delivered. And that the people should content themselves with that Christ hath taught, rejecting whatsoever else the boldness of men would put upon them. Did his office of Doctorship, then first begin when he came into the world? No: but when he opened first his fathers will unto us, by the ministery of his servants the Prophets: which the holy Ghost calleth the doctrine of the beginning of Christ; although it were divers hundred years before his conception: and after his owne time, he opened the same doctrine more plainely and fully by the Apostles and Evangelists. What difference is there between the teaching of Christ and of the Prophets and Ministers sent of him? First, that Christ taught with another authority then ever did any other Minister before or after him. Secondly, that by virtue of his prophetical office, he did not only bring an outward sound unto the eare; but wrought (as he did before his comming, and as he doth now by the Ministery of his word,) an alteration in the mind, so far as to the clearing of the understanding. What have we to gather that Christ taught and teacheth by the Prophets, Apostles, and Evangelist? First, in what estimation we ought to have the books of the old testament, sith the same spirit spake then, that speaketh now, and the same Christ. Secondly, we must carry our selves in the hearing of the word of God, not to harden our hearts. What effect hath the careless and fruitless hearing of Gods word? It hardneth men to further judgement; for it is a two edged sword to strike to life, or to death: it is either the savor of life, to life, or the savor of death to death. How doth he aggravate the refusal of this office of our Saviour against the Israelites? First, by the time, of 40 years: secondly, by the place, the wilderness; and by the multitude of his benefits. What force hath the office of his prophecy in us? We are in some sort partakers of it by the knowledge of his will, whereby to be able to exhort one another privatly to good things, and to withdraw one another from evil, as occasion serveth.